In these brain scans from the UCLA research, colors toward the red end of the scale indicate a higher concentration of the tracer used to determine the presence of abnormal proteins. In a small study of military personnel who had suffered head trauma and had reported memory and mood problems, UCLA researchers found brain changes similar to those seen in retired football players who may have chronic traumatic encephalopathy, a degenerative brain disease linked to repeated blows to the head. The current study, which builds upon the earlier research, analyzed seven military personnel (five veterans and two active duty members) who had suffered mild traumatic brain injuries and had memory or mood complaints. The subjects underwent neuropsychiatric evaluations and were given brain scans after being injected with FDDNP. The results were compared to those of the 15 previously studied retired football players, as well as 24 people with Alzheimer's dementia and 28 people without cognitive problems, for comparison. Dr. Gary Small, a professor of psychiatry and biobehavioral sciences at UCLA and director of the Longevity Center at UCLA's Semel Institute for Neuroscience and Human Behavior, is the study's senior author. Co-first authors are Dr. Stephen Chen and Dr. Prabha Siddarth, both of UCLA. Other authors are Jorge Barrio, Natacha Emerson, Chris Giza, Sung-Cheng Huang, Jie Liu, Jacqueline Martinez, David Merrill, Nagichettiar Satyamurthy and Koon-Pong Wong, all of UCLA; Robert Fitzsimmons of Fitzsimmons Law Offices in Wheeling, West Virginia; Julian Bailes co-director of NorthShore University HealthSystem's Neurological Institute in Evanston, Illinois; and Bennet Omalu of UC Davis. 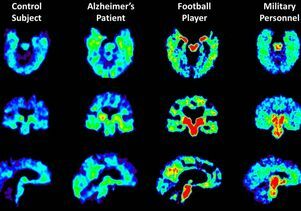 The study appeared July 17 in the Journal of Alzheimer's Disease. This study was supported by the Fran and Ray Stark Foundation Fund for Alzheimer's Disease Research; the Parlow-Solomon and Plot Professorships; Bob and Marion Wilson; the Ahmanson Foundation; the National Institutes of Health; and the Department of Energy. The FDDNP tracer is intellectual property owned by UCLA and licensed to TauMark LLC. Barrio, Huang, Omalu, Satyamurthy and Small are co-inventors of the marker. Barrio, Fitzsimmons, Huang, Satyamurthy and Small have a financial interest in TauMark. Other disclosures are listed in the study.